Why is Key West referred to as the Conch Republic? Because in 1982, there was a blockade set up on US1 right were the northern part of the Overseas Highway meets the mainland in Florida City. Every car was stopped from leaving the Keys and searched for illegal immigrants, which was the government’s response to the Mariel Boatlift. This blockage severely damaged the tourism industry and basically paralyzed Key West’s economy for a time. So the city of Key West briefly declared its independence from America as the Conch Republic! The conch symbol is still heavily celebrated in Key West and remains one of our most prominent symbols. Our Conch Republic Flag! Very befitting of our precious island! Flights From Key West to Havana? Before the Cuban Revolution in 1959, there were actually regular ferry and airplane flights between Key West and Havana! Key West had a plethora of refugees from Cuba during the period of the Mariel Boatlift. These refugees have continued to come ashore well into modern day. 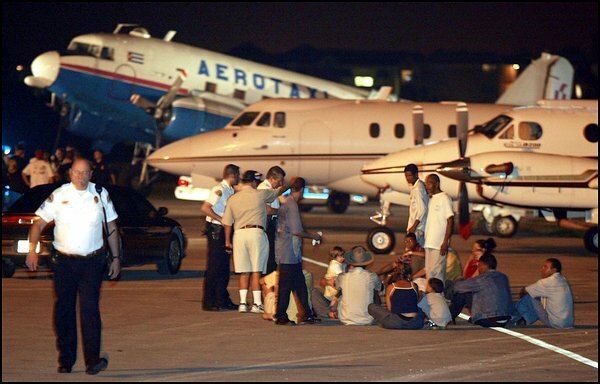 In fact, in 2003, Cuban refugees took over Cuban Airline planes and flew into Key West’s airport! Posted in Key West | Comments Off on Flights From Key West to Havana? Did you know that John F. Kennedy used the phrase “90 miles from Cuba” in many of his speeches against Fidel Castro? 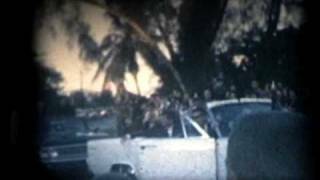 Kennedy even visited Key West a month after the resolution of the Cuban Missile Crisis! We were lucky to have had him in our midst! A picture of JFK visiting our wonderful little island! You are currently browsing the Old Town Trolley Tours Blog blog archives for September, 2013.